For full time professional fisherman, Captain John Sappington, fishing has been his life. With an impressive resume of tour winnings, championships and participation/qualification in the 2 most elite tours, the FLW Tour and the B.A.S.S. Fishing Tour, it’s safe to say he’s one of the best fishing guides in the country! For over 17 years John has fished full time furthering his skills as a professional fisherman and Branson MO fishing guide. Through his constant commitment to the sport of fishing, he has continued learning on a never-ceasing journey to be the best fisherman and guide he can be! 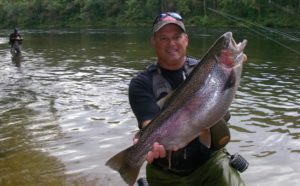 John makes the ideal fishing guide because of his love to share his knowledge and expertise with eager fisherman possessing the same desire to learn. Whether you share the same fishing ambitions as John or are just looking for a fun-filled day on a professionally guided fishing trip, you will get all you’re looking for and more with Fishing Guide Branson. Over the many years of his career, John has built an upstanding reputation as an honest and respectable fisherman. This, paired with his extensive knowledge and sheer love for the sport, is his personal recipe for providing great guided fishing trips. The benefit of taking a guided fishing trip with John is that it will ultimately lead you to become a more successful fisherman. You’ll be both reeling in the fish as well as knowledge of the sport while fishing with Captain John. For the guided fishing trip of a lifetime, you’ll find no better Branson MO fishing guide than sport fisherman, Captain John Sappington. To give you an idea of some of the accomplishments of his professional career, you can view them below. Browse through this website to take a look at rates and pictures of previously satisfied customers aboard our guided tours. We look forward to casting out with you very soon! ◦ Over $750,000.00 In Tour Winnings! Most clients of Guide John Sappington never realize his celebrity status. That may change this month when the Field and Stream Total Outdoorsman Challenge season finale airs Nov. 13 on the Outdoor Channel. Although the seven-day competition took place in August, primarily at Dogwood Canyon, the contests were filmed to air in weekly segments, so the winner has been kept a secret since the season started Oct. 3. But since the website now shows his photo, Sappington said, he can at least say he is in the finals. That competition and all of his previous wins as a professional bass fishermen with more than $750,000 in winnings seldom comes up on his Lake Taneycomo trips, he said. Parenting is a priority for Sappington himself, since he and his wife, Michelle, have a 20-month-old, Elizabeth, and a college son, Sean, studying at Drury University. He declined to “pratice” for the Outdoorsman Challenge, he said, instead directing his energies after guiding to the homefront. Since this was his fifth time in the competition, with two third-place finishes, Sappington, 50, said he was thankful that the contests seemed tailered toward him. In his younger years growing up around Kansas City, he competed in archery and shotgun competitions. Even after a boating accident in 2004 ended his professional bass competitions, he still entered some benchrest rifle contests sporting the halo brace for his broken neck and back. After studying business at Missouri Southern, Sappington was bullding houses for a living until the market fell into a slump. He had two speculation houses tying up all his money when he started a custom home for a Federal Express executive which led to an offer to be a relief driver. It soon became apparent that it was more lucrative to fish full time, and that began his professional fishing career 18 years ago. He accrued more than 20 pro top finishes, was an FLW Tour Classic Champion, a five-time FLW Tour Cup Qualifier and a Bass Master Classic Qualifier. 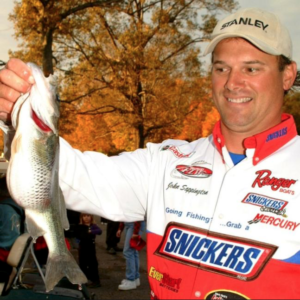 In 1999 he took second place in the Missouri Central Invitational Tournament on Table Rock. Although his cervical-one vertebra was fractured, he amazingly was not paralyzed. Surgeons wanted to fuse three other vertebrae together, but Sappington and Michelle, a physical therapist, decided to let his body heal naturally, keeping up with his physical therapy and wearing the halo for six months. “Doctors were telling me that I would never fish again, so it was a tough point for me,” he said. He did try to compete again, he said, but just had lost his competitive edge. 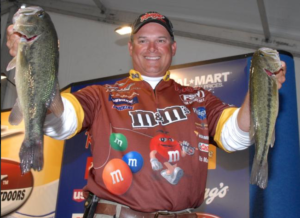 “When I was competing in bass fishing, I never wanted to fish for bass on my off time, ” he said. Lake Taneycomo had been an oasis of enjoyment for 30 years, especially the lure of big browns. Bass Pro Shops in Springfield has planned a public watch party for the Total Outdoorsman Challenge, which will air at 8:30 p.m. Wednesday, Nov. 13.